Laura Beth Walters fell in love with Joe McCall when she was six years old. Now she is counting the days until Joey graduates from college so they can marry and begin their life together. But the Korean War rips their neatly laid plans to shreds. Instead of a college fraternity, Joey joins a platoon. Laura Beth trades a traditional wedding for a quick trip to the courthouse. The couple endure the hardship of separation, but the true battle is faced when Joey returns from the war. Their marriage is soon tested beyond endurance. Laura must find a way to accept the tragedy thrown in their path or lose the love that has kept them anchored for so long. 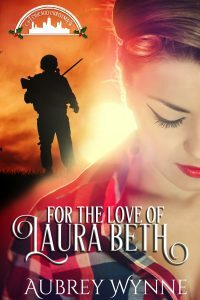 With a determination that only comes from the heart, Joe relentlessly fights an invisible enemy…for the love of Laura Beth. This story was inspired by my in-laws and the trials they experienced as a young couple. I wanted to tell the story of my in-laws. It was the kind of first kiss all girls dreamed of, hoped for, and rarely received. The kind of first kiss a girl saw in the movies or read in romance novels. The kind of first kiss a girl only whispered about because the moment was too precious to share. A moment Laura Beth Walters had waited over ten years for. She sighed and leaned her cheek into the hand that still cupped her face, afraid to open her eyes. Her lips still tingled from his touch. Her heart clamored against her chest. She wondered briefly if life would ever be this sweet again. Yes, this was love. She’d known it since first grade, but Mom said boys were a bit slower in the cleverness department. She peeked through her lashes and looked into his deep chocolate eyes. His lids were half closed, and a sated smile played on his lips, as if he’d just tasted something heavenly. Me, she thought wickedly. The moon threw shadows across his strong jaw and square chin. He was the most handsome boy in Kankakee. No, in the state of Illinois. No, in the entire Midwest. Laura shrugged, trying for poise but failing miserably when the grin would not leave her face. Daddy had been reluctant to let her date. Her mother had come to the rescue, convincing him that sixteen was old enough to date a boy they trusted. The McCalls lived down the street and owned the local mechanic shop. Joe was a hardworking, polite boy. Their families attended neighborhood barbecues, community, and school functions together.